After finishing the Viriconium series Harrison switched to writing stories that were mostly set in the real world, but still feature some fantastical elements. 1992’s “The Course of the Heart” starts with a trio of young Cambridge students about to perform a mysterious ritual under the guidance of the sinister Yaxley. The ritual is never described or explained but two decades later, when the main part of the story takes place, the three who carried out the ritual are still haunted by its consequences. One of the former students, the narrator of the story, seems to be the least affected of them, but still finds himself drawn into Yaxley’s schemes in an attempt to help his friends Lucas and Pat who struggle with illnesses and their faltering marriage. Yaxley suggests he may be able to help, but requires the narrator’s assistance with a sordid task that leads to the novel’s most disturbing event. Meanwhile, Lucas and Pat construct an elaborate mythology centred on the fictional world of The Couer. The Course of the Heart is definitely not a typical fantasy book. The story, even by Harrison’s standards is often obscure, key plot points like the ritual are never explained, and character motivations are often vague, particularly in the case of the novel’s seemingly decent narrator whose semi-willing involvement in Yaxley’s reprehensible plotting feels inconsistent with his actions in the rest of the novel. Despite this, the novel is still powerful and compelling and sometimes shocking and difficult to forget. There is a definite sense of melancholy for most of the novel, but there are occasional glimmers of hope among the darkness and cynicism. The point of the novel can sometimes be difficult to discern, although I think it has something to do with Harrison disdaining the characters’ obsession with mysticism and fantasy that eventually ruins all their lives.There is some vivid characterisation (despite the occasional inconsistencies) and the quality of the writing is, as usual with Harrison, mostly excellent although a few passages get so incoherent and divorced from reality that they end up being a bit nonsensical. 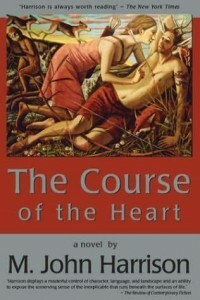 “The Course of the Heart” is not a novel that could be described as being accessible and it is often frustratingly obtuse but the writing itself largely makes up for this. This is not a novel that everyone is going to like but I’d still recommend it even if I don’t entirely understand it.